I already have a bank account with Bank of the Philippine Islands (BPI) so I have intention of opening any account with other banks. That's why it is unusual for me to open another bank account with Unionbank Ph. The reason that I opened an account with this bank is that I needed to verify my Paypal account. 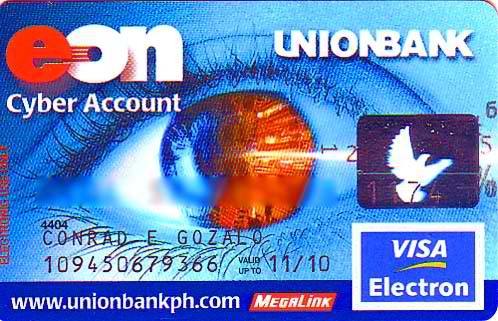 Only the EON account of Unionbank Ph is capable of verifying the Paypal account aside from using credit cards. We can say that I opened an Unionbank Ph EON account just for the sake of Paypal. I thought that that is the only benefit that I will get from EON. I was wrong because there are other benefits that I got when I opened an EON account. Here are some of the benefits that I got with Unionbank Ph EON account. 1. Another savings account – Unionbank Ph EON account is a savings account that earns interests. The interest is not that big but a little is better than nothing, right? 2. Paypal benefits – As I had said, I used my EON account to verify my Paypal account. Another good thing that EON can do is funding your Paypal. This means that you can add funds to your Paypal directly from EON. Thus, you can shop using Paypal as long as there's money in your EON account. 3. Pay your bills online – you can register an online account with your EON. This online account can be used to pay your bills online. 4. 24/7 Access – ATM too far away to check your balance? No need to fret. Just go to Unionbank Ph website and log-in to your EON online account to check the balance of your account. 5. Worldwide withdrawal – Unionbank Ph EON card can be used to withdraw money from any VISA PLUS ATM worldwide. So, you don't have to be anxious when you're abroad and need money. Just withdraw many from VISA PLUS ATM. These are the benefits that you can get with Unionbank Ph EON card. Visit my post about applying for EON account so you can enjoy these benefits.